Dr Rob Sivertsen is an experienced family dentist who provides high quality, modern dentistry. He is passionate about improving his patients’ oral health so that minimum intervention is required, and he will only recommend necessary treatment. 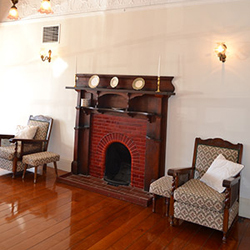 Our practice, Apollonia House Dental, is built on the foundation of dependability, consistency, and mutual respect. Below is a brief guide to some of the dental services our practice provides, should treatment be needed. If a second opinion, or more complex issue, requires further professional consultation, our team works with a trusted group of specialists to ensure our patients receive the best outcome. Checkups – Whether you are an existing or a new patient, or requiring a second opinion, our thorough examination process is designed to give a clear understanding of your current oral health. As an independent practitioner, if further treatment is required you can rely on Dr Sivertsen’s impartial recommendations. Composite Dental Fillings – Durable restorative work is designed to strengthen and extend the life of each tooth. As a policy, Dr Sivertsen thoroughly reviews all treatment alternatives with you. The use of images from our intra-oral camera often help to show where treatment is required. Preventive Cleans – Gentle, routine clean and polish appointments are ideal for keeping gum disease and superficial staining at bay. Most healthy adults and children benefit from an appointment every 6 to 12 months. Dental Emergencies – Each day, specific time is set aside to accommodate emergencies. Call early in the morning to let us know if you need urgent attention. Read more about dental emergencies. Nitrous Oxide (Happy Gas) – Children and apprehensive patients may benefit from the use of this common dental analgesic. It is also helpful to have just one parent or carer in the room with your child to help them feel at ease. Crowns – Deep cracks or tooth decay can compromise the integrity and function of a tooth, predisposing it to additional damage. A crown or “cap” provides an added level of protection, when a filling is not adequate. Extractions and Wisdom Teeth Removal – Sometimes it is best to remove a tooth instead of attempting to restore it. In instances of emergencies or impacted 3rd molars, a standard or surgical tooth removal is often the first step to restoring optimal, balanced oral health. Implant Restoration – Dr Sivertsen will complete your consultation and make an appropriate referral to a specialist, who will surgically place the implant. After surgery, you will return to our practice to have your final implant restorations placed (such as a crown or bridge). 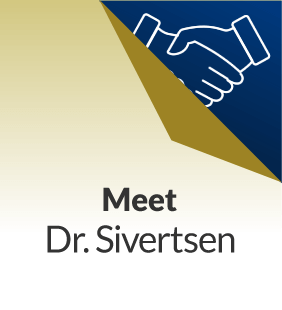 Patients of Dr Sivertsen can rely on clear information and ethical, honest opinions regarding their dental care choices. Schedule an appointment today.